Here at HorseTackNow.com we offer superior quality horse tack products and many great Horse Jumping Boots. These Open Front Combo Jumping Boots are composed of neoprene with high density foam fill in key areas. 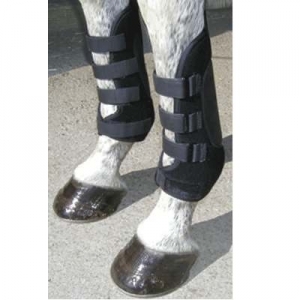 This pair of Horse Jumping Boots offers excellent protection for the suspensory ligaments and splint area. To accompany all the great features the Open Front Combo Jumping Boots are constructed of a light weight material that absorbs little water. It also has 4 Hook and Loop Closures. As you can see in the image above they will provide great comfort for your horse. These horse boots are available in black.